THE BREAKWATER FROM RAS-EL-KERUM, a point on the shore, extends for a mile and a half and is the longer of the two arms that enclose the deep-water harbour of Haifa. Quarried stone was used fro the breakwater, the largest blocks, some 12 tons or 15 tons in weight, being selected for the seaward face. Steel skips containing the smaller stone were lifted bodily from the railway trucks by a pillar crane capable of handling 15 tons at a radius of 60 feet and 12 tons at a radius of 75 feet. ONE of the problems confronting the British authorities when they took over the administration of Palestine from the League of Nations in 1922 was the lack of efficient harbour accommodation. Palestine’s facilities for handling ships and cargo were poor in the extreme. Along its 150 miles of coast there was no harbour that provided shelter for a modern cargo or passenger steamer. At Haifa and Jaffa, the country’s two recognized ports, the facilities for dealing with passengers and freight were out of date. At Haifa, situated at the southern extremity of the Bay of Acre, there was a small jetty. Although it offered shelter for small craft, it gave no protection to ocean-going vessels. These had to anchor half a mile or more offshore, and lighters were used for the transport of passengers and cargo to and from the quay. The roadstead lay open to the full force of the Mediterranean gales from the north and north-west. In bad weather trade was frequently interrupted and the damage done to shipping was considerable. Protection from the south and south-west winds was, however, given by Mount Carmel, which rises to a height of 1,750 feet behind the town. had to lie in the open sea, and passengers and freight had to be conveyed to and from the ship by lighters. Under British administration the trade of Palestine has increased enormously. This is particularly noticeable in the Jaffa orange trade. The export of this fruit increased from just over a million cases in the 1921-22 season to between five and six million cases by 1936. Palestine’s imports, too, have shown almost as remarkable a rise, the demand being particularly heavy for all kinds of building material, machinery and household commodities. Something had to be done to grapple with this increasing volume of export and import trade. A modern harbour somewhere along the coast was essential, but the point to decide was whether it should be built at Jaffa or at Haifa. The late Sir Frederick (then Mr.) Palmer was commissioned to make a survey of the coast in 1923, and he recommended Haifa as the most suitable position for a harbour. As Jaffa was at that time the principal port of the country his proposal met with strong opposition from numerous representative bodies in Palestine. Haifa, however, had many natural and economic advantages over Jaffa. The ridge of Mount Carmel provided shelter from the prevailing winds and the shore was found to shelve at a suitable slope for the building of quays and breakwaters. No rock had to be removed, and suitable stone for the breakwaters could be quarried in the neighbourhood. Not least, there were Haifa’s commercial claims. Haifa is the headquarters of the Palestine Railways, which link the town not only with the principal cities of the country, but also with Syria in the north, Transjordan in the east and Egypt in the south. Haifa, too, has since become one of the terminals of the pipe line from the oilfields of Iraq. Although the building of the harbour was sanctioned in 1927 at an estimated cost of £1,000,000, a detailed survey of the site had first to be carried out, so that work was not begun until two years later. 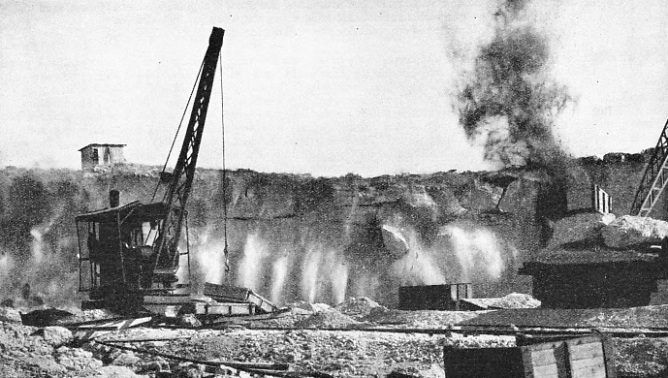 The first trainload of stone from the quarries was sent to the harbour site in October 1929. After further surveys upon the spot had been carried out by the engineers, Rendel, Palmer and Tritton, and certain elaborations of the original plan had been made, the estimate for the harbour works was increased to £1,250,000. The harbour has been formed by building two arms, or breakwaters, one of them a mile and a half long and the other half a mile long. The longer breakwater runs out from the shore near the point known as Ras-el-Kerum, almost parallel with the town front. This breakwater is built of blocks of natural quarried stone, graded according to size. The largest blocks, some 12 to 15 tons in weight, were placed on the seaward face. About 1,100,000 cubic yards of stone were required. The stone was placed in position by a specially designed pillar crane, capable of handling a load of 15 tons at a radius of 60 feet and 12 tons at a radius of 75 feet. All but the largest stones were tipped from steel skips, lifted bodily from the railway wagons on which they had been brought from the quarries. 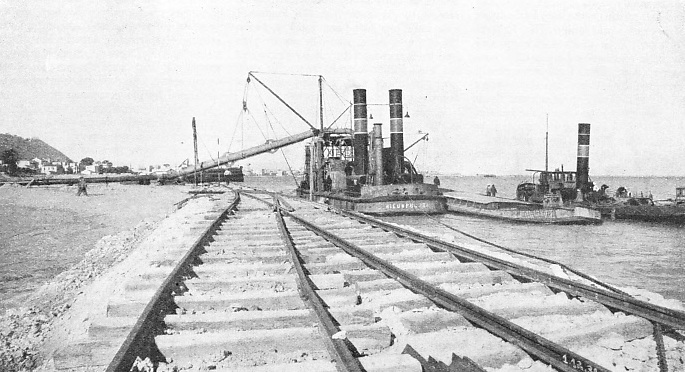 Some of the smaller grades of stones forming the core of the breakwater were deposited in advance from barges. The second arm, known as the lee breakwater, was built by prolonging the existing jetty. The lee breakwater contains some 230,000 cubic yards of stone and is of lighter construction than the main breakwater. The stone came from quarries at Athlit, about ten miles down the coast. The stone is a sandstone which, though somewhat light in density, is homogeneous in character. This made it possible to quarry the large natural blocks required for the protection of the seaward face of the breakwater. It was thus unnecessary to use artificial blocks of concrete or masonry. Altogether five units were kept at work in the quarries, each unit comprising one 15-tons derrick crane and two 5-tons travelling cranes. Up to 5,000 tons of stone were removed daily. The total quantity of stone removed from the quarry faces amounted to approximately 2,500,000 tons. 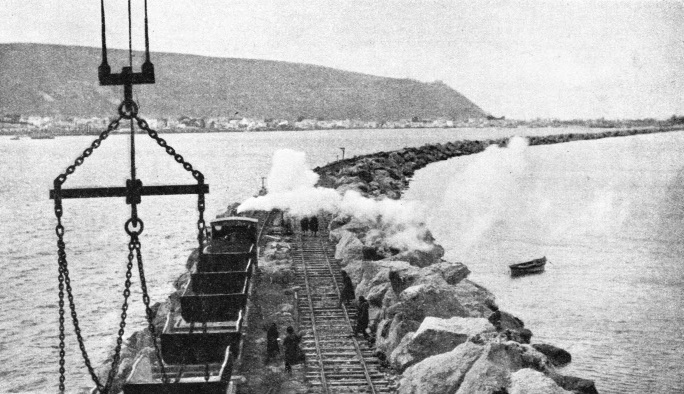 QUARRYING THE STONE which was used for building the breakwaters at Haifa was carried out at Athlit, about ten miles from the port. The rock quarried was a sandstone suitable for use in large natural blocks. About 2,500,000 tons of stone were quarried by five units, each consisting of one 15-tons derrick and two 5-tons travelling cranes. On the landward side of the water space enclosed by the breakwaters some 90 acres of land have been reclaimed. On this reclaimed land quays have been built. The deep-water quay, or main wharf, about 1,400 feet long, provides accommodation for three or four steamships. In addition there are some 850 feet of quay available for smaller vessels and lighters. The quay walls were composed of concrete blocks, from 5 tons to 7 tons in weight, capped with mass concrete. Elsewhere the reclaimed area was retained by rubble dikes. The new land thus obtained provided ample space for the accommodation required for the working of the port. Upon this land were erected transit sheds, custom house and port offices, with excellent roads and railways and large areas for open dumps or future sheds as might be required. The transit sheds are spacious steel-frame structures with russet brown asbestos cement roofing tiles and concrete block walls or galvanized steel side sheeting. In addition to the 40 acres reclaimed for the use of the port, about 50 acres were added to the town. The material for the reclamation came from the necessary dredging required to provide deep water in the harbour. Otherwise this material would have had to be dumped at sea. This dredging involved the removal of over 2,000,000 cubic yards of material, which was mainly sand. This was removed from the sea bed by two bucket dredgers. One was of 350 horse-power with buckets 1 cubic yard in capacity; the other dredger was smaller. The material was deposited by them into dumb (non self-propelling) barges. These were brought alongside a 550-horse-power pump barge, where the material was then mixed with water and pumped ashore through a 24-in pipe line to a maximum distance of about 2,000 feet. The area of sheltered water enclosed by the breakwaters is some 300 acres. About 190 acres of this area have been dredged to 37 feet, 25 acres to 33 feet and some 65 acres to 31 feet. The harbour is now capable of accommodating at moorings vessels up to 30,000 tons, enabling passengers to disembark within the shelter of the breakwaters. Vessels awaiting their turn at the quay or discharging their cargo into lighters are accommodated at stern-on moorings along the main breakwater. Haifa Harbour was officially opened in October 1933. So rapid has been the development of Haifa and Palestine generally that the port authorities are finding it difficult to keep pace with demands. By 1936 four transit sheds had been added to the two originally provided. An oil dock for the accommodation of tankers loading crude oil from the Iraq Petroleum Company’s pipe line has been built within the harbour. This dock is situated between the lee breakwater and two reinforced concrete jetties which separate it completely from the rest of the harbour. The main jetty to the west is about 1,500 feet long and accommodates two 500-feet tankers. The main jetty runs roughly parallel to the lee breakwater at a distance of some 800 feet from it. A subsidiary jetty, about 500 feet long, jutting out from the outer end of the breakwater, forms the northern boundary to the dock, leaving an entrance 350 feet wide. This can be closed for safety by a steel floating boom, operated electrically. On shore an area of 3 acres has been set aside for the facilities required for operating the dock, and additional reclamation to the east of the harbour provides a site for an oil tank farm some 20 acres in extent. Half a century ago Haifa was little more than a fishing village. To-day it is a busy port and industrial centre with a population of over 100,000. Although the new harbour at Haifa was expected to relieve some of the congestion at Jaffa, it soon became evident that something would have to be done to improve the shipping facilities at that ancient port. Despite the advantages afforded by the new port in the north, Jaffa was still going ahead, her exports and imports increasing at a remarkable rate. In 1922 the exports from Jaffa totalled 53,000 tons and the imports 103,000 tons; by 1934 these figures had grown to 121,000 and 487,000 tons respectively. The growth of Palestine shipping has been astonishing. In 1930, 830 ships, representing a tonnage of 1,800,000, anchored off Haifa and Jaffa. In 1935 the number had risen to 3,750 ships, representing about 6,000,000 tons. Jaffa had no harbour, only a small., shelter formed by a belt of jagged rocks, giving protection to lighters, and a narrow quay outside the custom house, situated in the most congested part of the old town. There were no proper facilities for handling cargo, and almost the whole of the work was done by manual labour. Steamers had - and still have - to lie about a mile offshore. RECLAMATION OF LAND at Haifa was effected by pumping over the landward side of the sea wall material dredged from the seaward side by two bucket dredgers. The dredged material, more than 2,000,000 cubic yards, mainly sand, was emptied into barges. Having been mixed with water, the sand was pumped over the wall through a 24-in pipe line by a pump barge of 550 horse-power. All loading and unloading is done by lighters. These are handled by Arabs, and the able way in which they manoeuvre their unwieldy craft by oars past the rocks and through the breakers shows experienced seamanship. The lighters carry from 10 to 15 tons of cargo and these little craft often handle 1,500 tons of cargo a day. Their work is frequently interrupted by stormy weather during the height of the shipping season, when the export of oranges forms the bulk of the trade. The loading of the steamers is often badly delayed during storms. Jaffa’s jagged, rock-protected haven has been enlarged and improved by the erection of a sea wall and a breakwater. Quays have been built, and upon reclaimed ground large transit sheds, warehouses, cranes and other facilities have been provided for the more rapid and efficient handling of the trade of the port. Over £300,000 was spent on this work. The ancient town is built on a rocky hill projecting in the form of a small cape slightly beyond the general run of the coastline. At this rocky headland the shore is protected by a reef, running almost straight from north to south. It lies just awash, about 300 to 400 feet from the shore, with isolated rocks projecting from the surf. In Biblical times the reef was probably much more pronounced and more continuous, and stood higher above the water, thus fulfilling the role of a natural breakwater to protect the shallow-draught vessels of those days. It is the ancient refuge used by the ships of Solomon’s navy which the engineers have restored. The rocky barrier of the reef had been eroded by the pounding of the sea throughout the centuries until it had been worn down almost to sea level. On the landward side buildings had been built down to the water’s edge, and the water area had been encroached upon by quays and sea walls, built to make room for such port buildings and working areas as were in use up to a few years ago. A sea wall has been built on the reef. At its southern end the wall makes a return bend and connects with the shore south of the town. Some 11½ acres of land have been reclaimed within the protection of this wall. To the north the wall is prolonged along the reef to form a breakwater, the combined length of sea wall and breakwater being about 3,500 feet. The breakwater and sea wall are built up of concrete bonded to the existing reef. Fissures in the reef were cleaned and sealed with concrete, and the reef was trimmed to form a foundation, or built up to mean sea level by concrete placed in underwater shuttering or deposited in bags. On the foundation thus obtained a crest to a height of 10 feet above sea level was built of precast dovetailed blocks and mass concrete strengthened by steel bars. Difficulty was encountered in obtaining a satisfactory bond between the crest and the reef. The method finally adopted was to drill holes through the first lift of concrete well into the reef and to insert through these holes steel bars grouted in with neat cement. Tests on bars placed by this method showed a safe resistance of 15 tons a bar. Work on the exposed reef was much hindered, especially during winter months, by rough seas. During several storms considerable damage was done to temporary works. Shuttering was displaced and service gant.ies were swept away. No damage, however, was sustained by the permanent works, and the finished breakwater has successfully withstood storms and proved satisfactory in every way. A false quay was added to part of the existing quay where the water was too shallow to permit of lighters working safely alongside. This was extended southwards as a gravity quay, the two sections together forming the new East Quay. The South Quay, which also is of a gravity type, runs between the East Quay and the breakwater, and at right angles to them. The top of all quays is 6½ feet above mean sea level. The false quay consists of timber steps carried on a steel and concrete framework anchored to the existing quay. The South Quay and the gravity wall section of the East Quay are of mass concrete, divided into sections by precast steps. The steps lead up from 3 feet above water to the quay proper. THE COMPLETED MAIN BREAKWATER at Haifa has a concrete capping and a parapet, with recesses for bollards. Some 300 acres of water have been enclosed by this arm and by the smaller, or lee breakwater. Of this area about 190 acres have been dredged to a depth of 37 feet, so that vessels of up to 30,000 tons can moor in the harbour. No difficulty was encountered in founding the South Quay on the reef, but considerable gaps in the reef structure were discovered along the line of the East Quay. Bores put down in these gaps indicated sand and the accumulated rubbish of centuries down to about 50 feet below mean sea level. On these sections the gravity wall was built on a consolidated rubble foundation. The first lift of concrete was divided into sections by bold vertical joints, and each section was tested with kentledge loading - that is, with pigs of iron - before the concrete was poured. The area of water enclosed by the breakwater is 10¾ acres and has been dredged throughout to a depth of 6½ feet. The dredging was done by grabs operated by 5-tons cranes mounted on pontoons. Here and there blasting had to be resorted to because of rocks, which were in reality sections of the submerged reef. With a depth of 64 feet the harbour is suitable only for lighters and small craft. Permanent moorings have been laid down to accommodate some 200 of these vessels. Cargo and passenger boats have still to lie off shore in the open roadstead. The southern portion of the reclaimed area is being developed as a dump ground for timber, cement, tiles, iron and similar goods. It has good roads and drainage. Provision is made also for covering and paving the dumps, if necessary. Along the South and East Quays two spacious transit sheds have been erected, equipped with wall cranes, chutes and conveyers. The south transit shed, which has a capacity for 180,000 cases of citrous fruit, is a single-story structure ending in a two-stories office block, where are the customs and other port services. The transit sheds are steel frame structures, with roofing and side sheeting similar to that used for the sheds at Haifa. In addition to this equipment, the port is provided with three weighbridges, and at essential points along the quays 3-tons and 7-tons cranes have been installed for the handling of cargo. The cranes as well as the conveyer equipment are electrically operated. Adjoining Jaffa to the north is the new Jewish city of Tel-Aviv. It has grown rapidly during the past decade and is now the largest city in Palestine, having a population of some 150,000, all Jews. The new city is a busy commercial centre. The Jews have long desired to convert Tel-Aviv into a port, and their hopes have now begun to take practical shape. During the six months’ Arab strike of 1936, when the Port of Jaffa was closed and the Jewish communities in Tel-Aviv and Jerusalem experienced difficulty in procuring goods from outside, permission was granted for the discharge of certain categories of goods on the seashore at Tel-Aviv. Within two days of the granting of this permission unloading began. The conditions were primitive, and in their enthusiasm Jewish boatmen entered the sea to their waists, carrying the goods on their backs up the shore to the hastily erected custom house. A small wooden jetty was built out to facilitate the unloading of lighters. This was soon found to be unsuitable for efficient service. It has been replaced by a permanent timber-decked steel jetty, 720 feet long and 21 feet wide, equipped with cranes and rails for the rapid handling of cargo. For several months during calm weather between 400 and 500 tons of cargo a day were landed upon the jetty, and some 50 tons of Palestinian goods were shipped from it daily. Then came the problem of providing shelter for the lighters when the weather was bad. The first idea was to run the lighters into the mouth of the Yarkon River close by. This did not prove satisfactory, and an alternative scheme was begun for a small port on the shore. 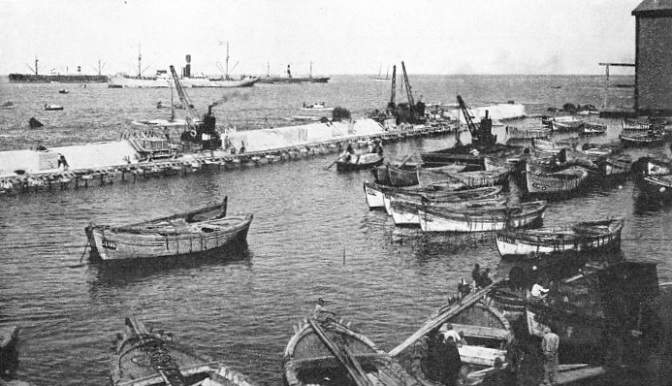 Later the Harbour and Communications Council of Tel-Aviv decided to increase this port in size to form a lighterage port on the lines of that at Jaffa. The harbour, which has been formed by building two long sea walls out from the shore, provides accommodation for about eighty lighters, the area of sheltered water being some 75,300 square feet. A slipway for the repair of lighters has also been provided within the harbour. The quay at Tel-Aviv, which has a length of 425 feet, will permit of the loading of from 10,000 to 15,000 cases of citrous fruit a day. RAISING THE CREST on the north end of the 3 500 feet sea wall and breakwater at Jaffa. The wall was built on a partly submerged reef. Fissures were cleaned and sealed with concrete before the crest was raised. Holes were bored to receive steel bars which were grouted in to form a bond between the 10-feet crest and the foundations. The crest was built of precast dovetailed blocks of concrete.